Chien-Ming Wang's previous two starts had done much to alleviate the pressure his manager had put on him, but something was still missing. "Let's get him a win," Joe Girardi said. And the Yankees did last night - finally. Wang entered last night's start against the Mets at 0-6, but he allowed two runs and four hits in 51/3 innings and left with a 3-2 lead in the Yankees' 4-2 victory to finally record that elusive first victory. His ERA, 34.50 after his first three starts, is now down to 10.06. Wang had earned his most recent victory June 15, 2008, in a 13-0 win over the Astros - his last game of the season, as he suffered a foot injury while scoring one of those 13 runs. The day after Wang lasted only 22/3 innings June 10 in a loss at Boston, Girardi made it clear that he had a shaky hold on his spot in the rotation. 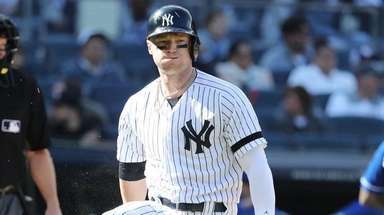 "As I told him, it's important that he has a good start," Girardi said June 11 in Boston. "He needs to show us that he's back and that he's fully back. At some point, production is important." Girardi thought he had gotten that in Wang's two most recent starts before last night, or at least enough to not make each start its own trial. "My plan for Chien-Ming Wang is he's starting [against the Mets] and he'll start Saturday again against Toronto," Girardi said Saturday. "This is a different feeling than when I made the point [in Boston] that this start really means a lot. Every start means a lot, but he had to show us better stuff, better command and the ability to pitch deeper into the game. And he's showed us that. So he's not necessarily start-by-start anymore." 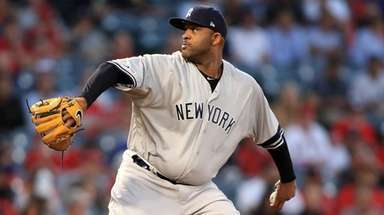 After the poor outing in Boston, the Yankees lost both of Wang's subsequent starts, though he pitched reasonably well. He allowed three earned runs in five innings in both defeats - 3-2 June 17 against the Nationals and 4-0 June 23 against the Braves. In his seven starts before last night, the Yankees were averaging 1.57 runs. "I think it's important that we score some runs for him," Girardi said. "Because I think he's lost 3-2 and [4-0] his last two games. I think it's important we get some runs for him and just allow him to do his thing." 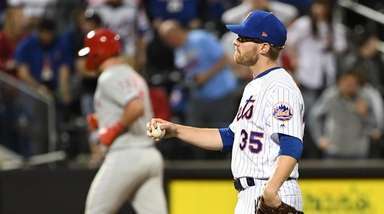 Staked to a quick 3-0 lead, Wang limited the Mets to one hit in the first three innings. But they scored twice in the fourth, on Fernando Martinez's one-out double and Luis Castillo's two-out RBI single to move within 3-2 of the Yankees. A slim lead - but Phil Coke, Phil Hughes, Brian Bruney and Rivera protected it, and Rivera's RBI walk in the ninth added to it.